In 1848 James Egan took up a pastoral run at Yandoit, west of Daylesford. Egan found gold at Daylesford in August 1851 (according to family history) or February 1852 (according to official reports), which led to the field at Wombat Flat near Lake Daylesford and the more general Jim Crow diggings. 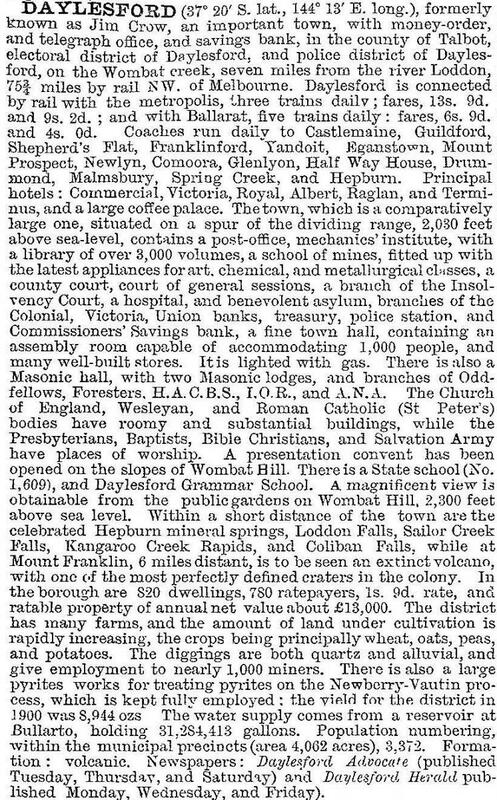 In June 1854, the town of Wombat was surveyed, but was gazetted as Daylesford in August 1855. The name was apparently inspired by Warren Hastings' home, 'Daylesford', in Worcester, England. It was proclaimed a borough on 23 September 1859. An Anglican school was opened in 1857. A significant non-Anglo Saxon population came to the Daylesford and Hepburn diggings when Italian-speaking miners began arriving in 1854. Italian Hill, north-east of Jubilee Lake was tunnel-mined for gold which lay in streams which had been covered by volcanic debris from Wombat Hill on the north-east edge of the town. Jubilee Lake was formed by damming Wombat Creek to form a reservoir in 1861. The 1860s saw the formation of several institutions and the consolidation of quartz mining as the alluvial diggings gave out. In 1861 a Catholic school was opened and the Wombat Hill botanic garden was begun. There followed the hospital and the court house (1862), St Peter's Catholic church (1865, replacing a wooden structure) and some measures to protect the springs and spa waters which had unhappily co-existed with tunnel mining. There was also a flourmill, two newspapers, a mechanics' institute, a racecourse, numerous hotels and quartz-crushing plants. The township was riddled with underground tunnels, tapping into the Ajax axial lead on the west side and the Cornish axial lead on the east side. The winding, steep-graded railway line was closed at the Creswick end in 1953, and to Woodend in 1978. The late 1970s coincided with renewed interest in spa waters. By then, however, guest houses had declined from 22 (1932) to 14 (1951) to nil. In 1977 the Department of Minerals and Energy surveyed spa water sources with recommended take-offs for preservation of supply, and a proposed royalty for harvesting. The Hepburn Bath House was restored with State Government assistance in 1984. About 75% of Victoria's recorded mineral springs are in the Daylesford-Kyneton region, and Daylesford is marketed as the spa centre of Australia. Its other attractions include the restored railway line from the station near Wombat Hill to Ballarto, Lake Daylesford, and a range of hotels and bed and breakfasts. Lake Daylesford is an artificial lake covering much of the Wombat Flat diggings, and has boating, picnic reserves and three mineral springs. A museum occupies the old school of mines. The town's registered historic buildings are the court house, the primary school (1875) and the railway station (1881). There are numerous walking tracks to long established scenic sites: Tipperary Springs, Breakneck Gorge and memorials to three lost children (1867). Whilst some of the Wombat Hill botanic gardens' built structures have fallen down, several of the aged exotic trees are rare. A spa festival is held each April and a highland gathering each December. Daylesford has five churches, a hospital, a caravan/camping ground at Lake Jubilee, two recreation reserves, a newspaper, a primary school (298 pupils, 2014) and a secondary college (464 pupils, 2014). A Catholic convent school near Wombat Hill closed in 1982, and is now the Convent Gallery. The town has an active shopping centre, including outlets for antiques and books. Daylesford borough was united with Glenlyon Shire on 31 May 1966. On 19 January 1995, Daylesford and Glenlyon Shire was united with Creswick Shire and parts of Talbot and Clunes and Kyneton shires to become Hepburn Shire. Daylesford is the shire's administrative centre.